After saying our goodbyes to friends and family, we hit the trail. We soon came upon a hillside covered in dark purple flowers. 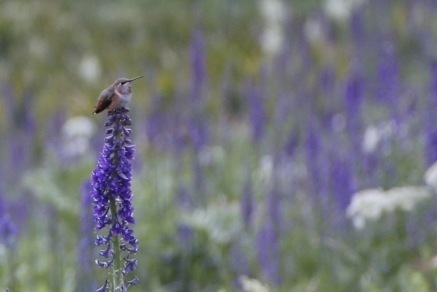 A large flock of hummingbirds was enjoying the flowers’ nectar and chasing each other through the blossoms. When they needed a rest, they would perch on the flower stalks, which didn’t even bow under their weight. We paused to watch for a few minutes. We had never seen so many hummingbirds in one place before, and they were beautifully playful. 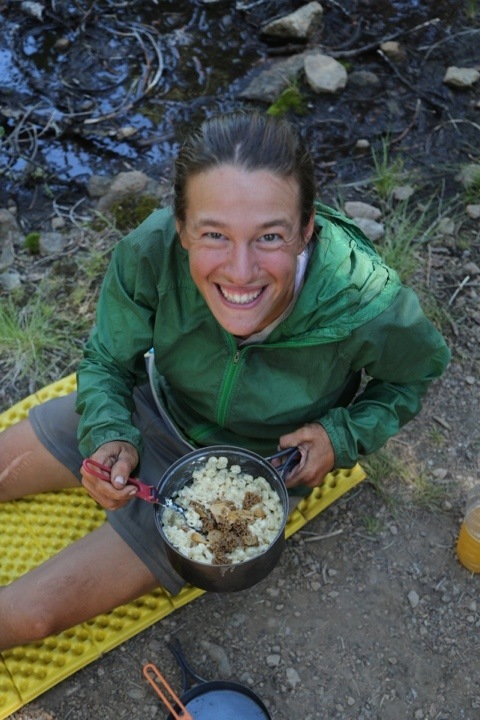 After a mix of forest and open vista walking, we reached a spring, where we cooked lunch with the clear, cold water. Parmesan pasta was on the menu, but with an awesome twist: North Star’s aunt Jan forages for mushrooms, and had sent us dried morels. We rehydrated those and added them to the pasta. The flavor was wonderful. After lunch we walked along a curving ridge, and eventually almost circled back on ourselves! 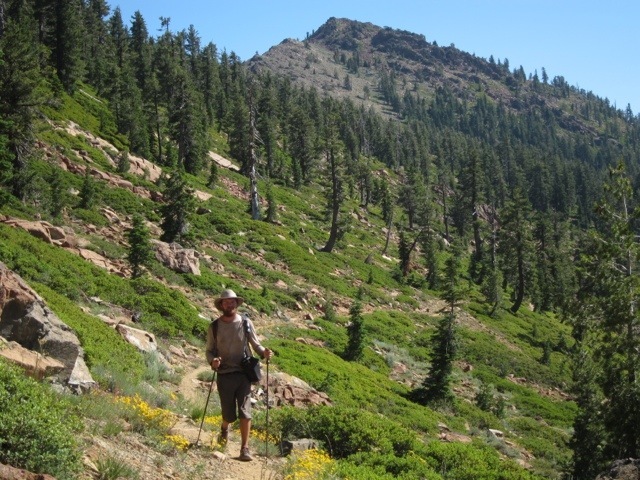 This part of the PCT wandered all over the place, including, for some portions, to the south. It felt as if California didn’t want to let us cross into Oregon. Still, we made good progress, and were rewarded with a very sweet sunset in the forest. 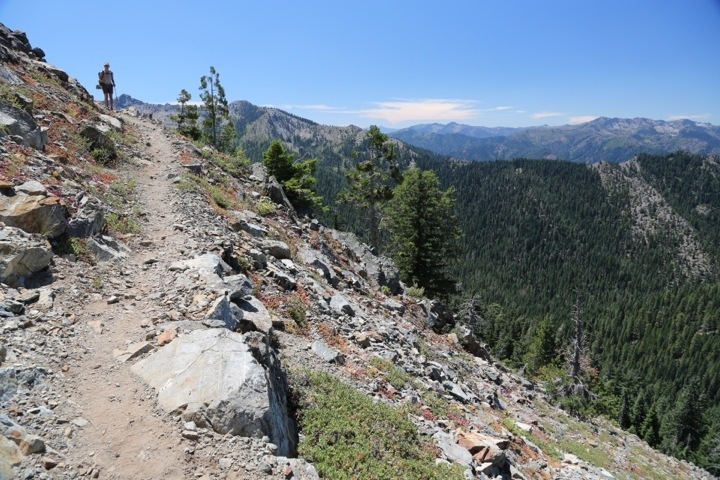 Today we hiked through the Trinity Alps Wilderness, which featured many views of peaks and lakes. Next we entered forest, where we walked numerous miles. Occasionally snow-covered peaks were viewable to the north. As the sun began to set, we reached the top of a ridge and saw the moon rise against the sky’s vibrant colors. The view was spectacular in all directions. 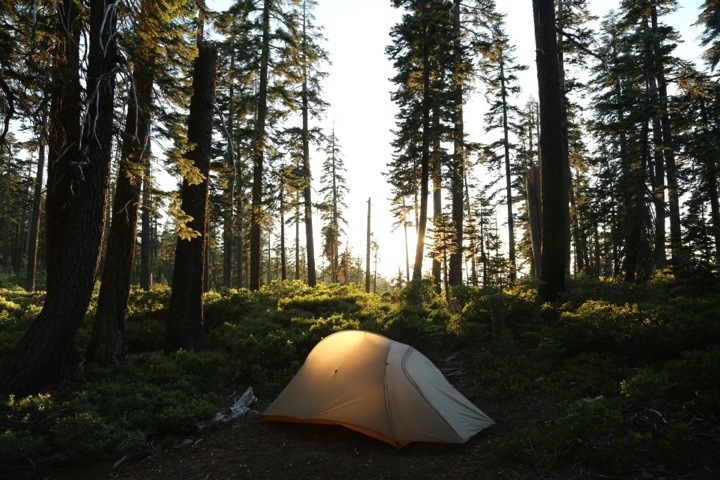 At that point, the light was fading, and we needed to camp. We heard noisy cows grazing near the area where we originally planned to camp, so we continued on. This was a gamble, because the topo map showed only a few flatter areas before the trail traversed a steep hillside for several miles. Unfortunately we soon learned that those flat areas were covered in either manzanita or boulders. We ended up settling for a very tight, bumpy spot that sloped uncomfortably. We made it work, though. In the morning, we crossed into the Russian Wilderness, hiking along a hillside with a deep, treelined valley below and dramatic exposed rock faces. We found some playful critters too. Around midday we were excited to encounter a patch of snow! Shutterbug put some in his hat, and for the next hour, he deeply enjoyed a cool head in the August heat. Reaching the highway, we hitched a ride into Etna with Keith Whipple, a 90 year old rancher. Keith related to us that as he aged, he realized that being in nature was what was most important to him. He told us he had put his ranch into a conservation easement so no one could build on his land in the future. He had also planted thousands of trees, in part to provide shade for fish in the river that runs through his land. We were impressed with his foresight and his determined action to protect the land and the creatures who live there. 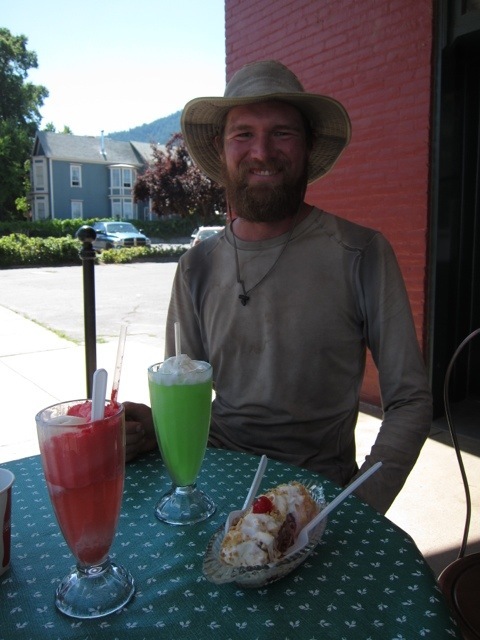 When we reached Etna, we asked Keith to drop us off at the drugstore, which featured an old fashioned ice cream parlor. Of course we had to sample a few of their offerings. After eating our fill, we shopped for food, then retired to Alderbrook Manor, the local B&B, for some rest. The B&B served a fantastic breakfast, including fresh homemade bread and fruit salad. Better still, the portions were large enough to satisfy our hungry hiker appetites. After the meal, the owner gave us a ride back to the trail. We set out in high spirits. At a small lake, we found newts swimming and playing. 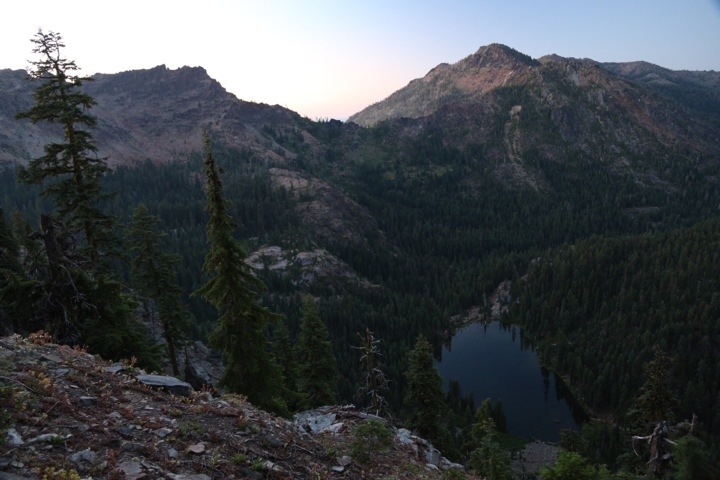 After that, we climbed some rocky switchbacks up over a saddle, and saw an alpine lake in the tree-lined valley far below. This section of the Marble Mountain Wilderness felt like a smaller version of the Sierras. The landscape was unexpected and exciting. In the evening, we entered a forest of huge old trees. We stopped there to camp, and felt we were in an ancient place. At the edge of the forest we found the perfect spot to watch the last light of the day disappear. All right, that’s it. Those photos really make me want to have newts again. Such amazing and mellow little creatures .. I miss having them around. They were really fun to watch as they cavorted in the lake. I can see why they would make great pets! These had lovely bright red bellies too. The ones I had as a kid were Japanese Fire-bellied newts.. looked just like those. I wonder if these are similar? They certainly look the same. We’re not sure what type of newt, but they sure are cute! I was thinking about you 2 last night at Sangha. The Dharma talk was on new research & various articles on multi-tasking; how dangerous it can be to text while driving, how it’s not really a more “efficient” use of time, and that if young children do it too much (e.g., homework plus TV), their brain development may be adversely affected. I was wondering what thoughts you 2 had about how you will transition back to the world of multi-media, and if you think you will change the frequency of your activity with tech phones, etc., in the long haul….. It is wonderful to be in a place with few distractions, where we can focus our minds and observe everything around us. It’s a great gift. At the same time, though, we do use our phones to post to our blog and respond to comments. That’s our way of sharing the gift with others. I would say, regardless of the technology you use, staying focused is key. There’s nothing inherently distracting or bad about a computer or smartphone. But you must have the discipline to limit your use and put it away when you are done. 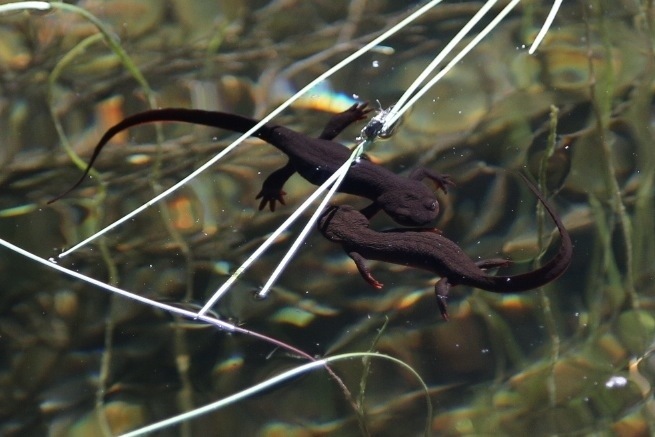 Aw, look at those little newts with their little newtsie toes! Was it hard to get a photo? It took a bit of watching, waiting for them to create a good composition. On the technical side, I used my polarizing filter to cut the reflection from the water, and I upped the ISO so I could get a clear shot without blur from their quick movements. So I would say, as with many shots, I drew on years of experience to make this work, but the time I spent watching was fairly short. Thanks so much Tim! We’re looking forward to seeing you too. In fact, later today we plan to look at our overview itinerary for Oregon and email friends in the area. We always strive to make the world a better place, and we’ve learned that we can contribute to that even while we are on the trail through this blog. It’s very exciting to share the wild beauty, kindnesses of strangers, and excitement of discovery with thousands of people online. Really look forward to reading your updates a few times each week. I’ve really loved to watch the landscapes change these past few months. Am admiring your enthusiasm, such an accomplishment –you have crossed this whole big state on foot! Good luck in Oregon. Thanks for giving me some nature to view from my bland cubicle. BTW, we update the map with your location every day or two. Great to hear from you, Dave! Glad you’re enjoying the photos. You and everyone else at EPA help to keep these lands beautiful, so thank you! You guys just make me smile, no …beam. Keep em coming. Awesome, it’s our pleasure! We are happy to spread the beauty and joy around, and we will keep it up. Thanks, I’m happy to work hard on the photos knowing so many people appreciate them! 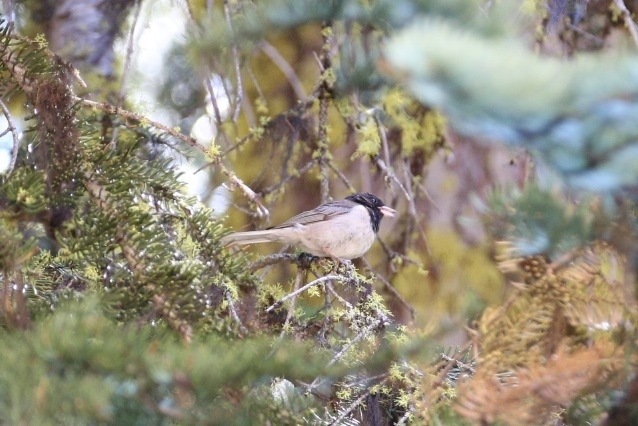 Every one of these pictures is so special–from the hummingbirds that don’t bend the flower stalks, to the snow-hat refrigeration method, the ice cream parlor extravaganza, the gift of the wild mushrooms in the pasta, the little critters, and of course the amazing scenery. And your beautiful commentary. Thank you again so much for taking the time to let us share in your adventures! Aside from all the photos I already mentioned, one of my favorites is of Shutterbug walking along the green hillside with the yellow wildflowers. Thanks, so glad you like these photos! North Star spotted the newts in the lake, and they would have been easy to overlook. 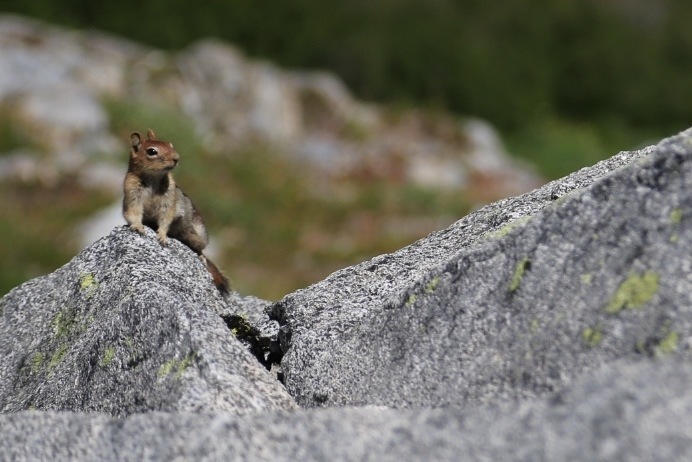 We see a lot of wildlife on the PCT, but much of it is very difficult to photograph. Most animals are afraid of humans and move quickly away from us. We were very excited in this post to present some of these hard-to-capture images. North Star definitely does a great job with her photos of me. I’m not wildlife, but I do move quickly sometimes! I am finally reading all of your posts and enjoying them hugely. I met you on the trail from Little Willow Lake to Drakesbad where I was vacationing with my family. 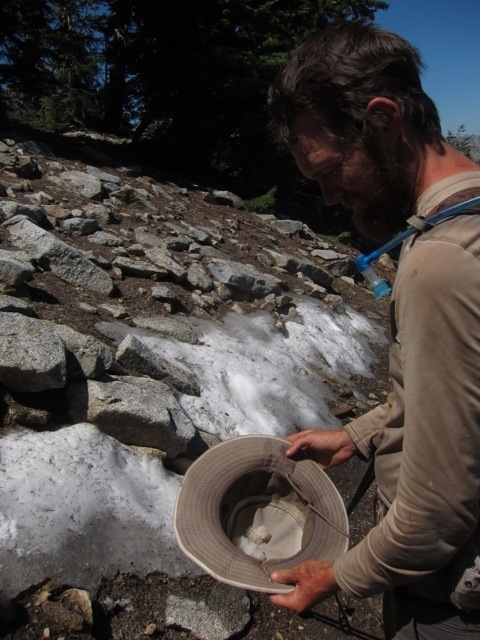 With this post you have gotten into the Marble Mountains where I once spent 15 days on a Sierra Club Service Trip building a new trail to Lost Lake. It was my one and only trip to the Marbles, but like you it reminded me so much of the High Sierra but without the altitude. Thanks Nancy, it was good to meet you, and we are glad you’re enjoying the posts so much. The Marble Mountains were beautiful indeed, and we just enjoyed the Three Sisters. So much to love out here in the wilderness. Happy hiking!